Within the five lines and four spaces of a staff, a composer creates all manner of beauty and complexity. Everything the composer wants to communicate to both the musician and the audience is condensed into the staves on the page. Whether summoning all the colors of a full orchestra or the singular artistry of a solo instrument; it’s all contained within those lines and spaces. For our second Theme & Variations recipe collection, we take our cue from the staff to make a delicious composition of our own in the kitchen using everyone’s favorite comfort food as our theme: lasagna! 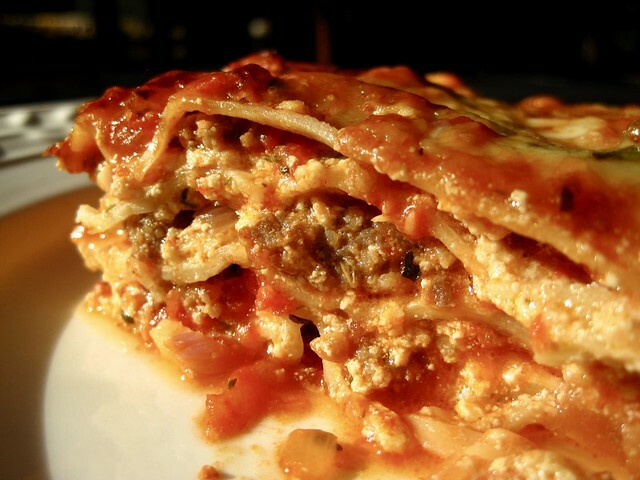 Today’s recipe is what most people imagine when they think of lasagna: layers of hearty meat sauce alternating with luscious lasagna noodles and a tempting mixture of cheeses. 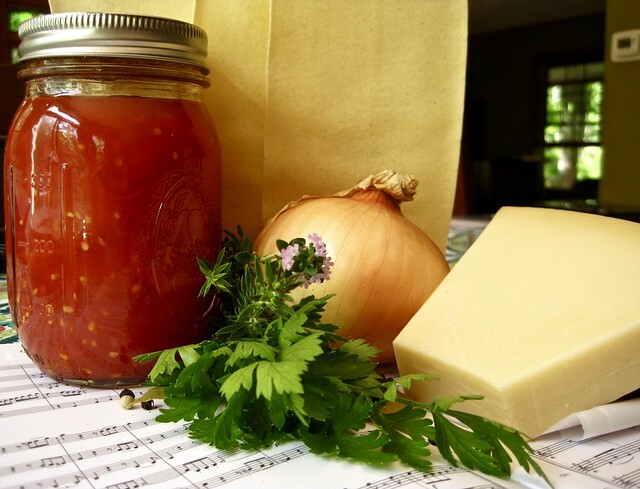 It’s a recipe with a fancy look but humble origins — you can find everything you need in almost any grocery store (some of it’s probably already in your kitchen!). KEY INGREDIENT: No-Boil Lasagna Noodles — Homemade lasagna doesn’t get more convenient than a package of no-boil lasagna sheets. 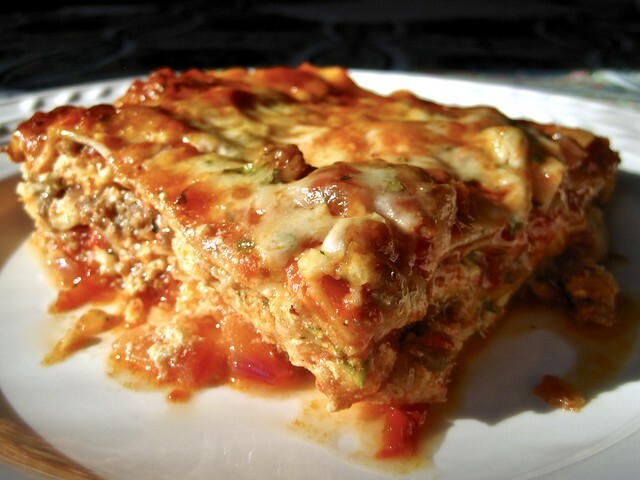 Unlike the traditional lasagna noodles which need to be par-cooked before you layer them into the casserole dish, no-boil or “oven-ready” noodles can go right into the casserole dish. They cook while the casserole bakes, absorbing liquid and flavors from everything around them. Barilla is probably the brand easiest to spot. Unlike traditional lasagna recipes with pre-boiled noodles filling a gigantic pan of sauce and cheese to meld together in the oven, this smaller four-serving casserole goes into the oven with very little babysitting required. The hardest part is letting it cool for 20 minutes before digging in. Preheat oven to 375-degrees. Heat the oil in a 12-inch skillet over medium-high heat until just shimmering. Add the Italian sausage; cook and crumble until evenly browned and no pink remains. Using a slotted spoon, remove crumbled sausage to a plate. To the skillet, add the onion; cook, stirring occasionally, until softened and just beginning to brown. Add the garlic, oregano, and thyme; cook, stirring, just until fragrant (about 30 seconds). Add the canned tomatoes, scraping the browned bits from the bottom of the pan. Stir and crush the tomatoes into mixture; bring to a low boil and allow to simmer for 5-10 minutes until slightly thickened; season with salt and pepper to taste. Set sauce aside to cool slightly. Meanwhile, in a medium bowl, combine the ricotta, egg, parsley, grated Parmesan, and half of the mozzarella. Season to taste with salt and pepper. Spread 1/2 cup of the tomato sauce in the bottom of an 8-inch square baking dish. Top with 2 lasagna noodles centered in the dish (the noodles will expand quite a bit during cooking and cover all the way to the edges). Spread 1/3 of the ricotta mixture atop the noodles and top with 1/3 of the remaining sauce. Repeat layers with the remaining noodles, cheese, and sauce. Top the entire casserole with the reserved shredded mozzarella cheese and additional chopped parsley as desired. Loosely cover with parchment then top with foil to seal (keeps the cheese from sticking to the foil!). Bake 30 minutes. Uncover and bake until bubbly and slightly browned on top, about 15 minutes more. Let cool 20 minutes, then slice and serve.